My favorite deacon rants every year about the moving of the once holy day of obligation, Ascension Thursday, to Sunday. But he deeply dislikes the change for more personal reasons. As anyone who has gone through RCIA with us knows, Deacon Larry thinks that the only Gospel is the Gospel of John. He loves this video where Stephen Colbert calls the Gospels of Matthew, Mark and Luke rough drafts. Heh. Well when the seventh Sunday of Easter is bumped off the calendar for the Ascension, my deacon misses his only chance to proclaim his favorite chapter in his favorite Gospel: John 17. The last discourse of Jesus and his high priestly prayer is omitted from the Liturgy. Anyway Father Z has a different reason for ranting on what he calls Ascension Thursday Sunday. 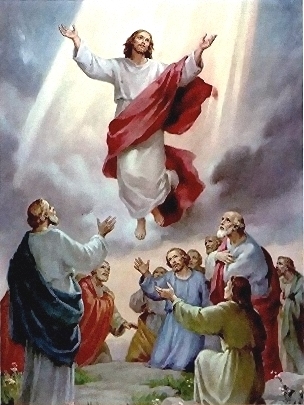 However, by the same logical that dislocated Epiphany from its proper place twelve days after Christmas (“Twelfth Night”), some years ago the Holy See allowed conferences of bishops to transfer the celebration of Ascension Thursday to the following Sunday. I call this liturgical quirk “Ascension Thursday Sunday”. Those who are participating at Holy Mass with the 1962MR avoid this folderol. I know the argument. The bishops hope to expose more people to the mystery of the Ascension of the Lord. Because it is too hard to go to Mass also on Thursday, they moved the feast to Sunday. Well… in most places they moved it to Sunday. What is even more confusing is that it isn’t transferred in some dioceses. In the 1983 Code of Canon Law c. 1246, Ascension Thursday is indicated as one of the few Holy Days of Obligation. Again, I know the “laudable” reason for moving the feast. However, perhaps it is the influence of reading so much St. Augustine over the years, but my present view of human nature suggests to me that when Holy Mother Church’s pastors lower expectations regarding the liturgy, people get the hint: it just isn’t that important. Maybe none of it is important. I think the option to dislocate such an important and ancient feast is an arrogant novelty. It is rather long but interesting rant. Read it all here. If you are wondering why the Ascension matters read Fr. Barron’s post over at Real Clear Religion. This entry was posted in Catholic Church, Liturgy and tagged Ascension of Christ, Holy day of obligation. Bookmark the permalink. There is Mass at St. Anthony’s. I know, but my poor deacon still misses out on John 17 which is only read on the seventh Sunday of Easter. It is bumped for the Gospel on the Ascension.